The OMEGA™ low noise thermocouple probes and connectors maintain an electrical connection from the sheath of the probe, through the connectors, all the way to your instrumentation. This system assures high accuracy measurements, providing protection against electrical noise. The external strap maintains the electrical connection of the sheilding wire, and also strengthens the mechanical connection between the two connectors. The socket features a handy write-on area, for easy identification. * Specify junction type: G (Grounded), E (Exposed), or U (Insulated). 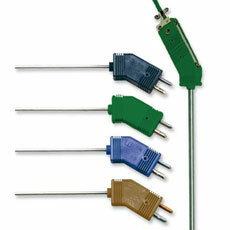 To specify Inconel® probes, replace "SS" in Model Number with "IN". Example: GKQIN-IM30U-300, Quick Disconnect Type K Probe with Low Noise, Standard connectors, Inconel sheath, 3.0 mm dia, 300 mm length. Nota: Each probe includes a protective earth strap. For applications not requiring the external earth strap, plastic write-on windows are included with each probe and connector to provide additional write-on areas. Note: Windows cannot be used concurrently with earth strap.